Our Fathers Word and Illegal Immigration | Have Ye Not Read? If you listen to some of the liberal religious folks weighing on the subject of immigration, you’d think it was a sin to institute common-sense background checks (now dubbed “extreme vetting” by the liberal news media) on foreign migrants seeking to enter this country from nations generally considered to be hostile to our own (and from religions hostile to our own). But importing enemies, without restriction, into your own country is not “compassion,” it’s national suicide. 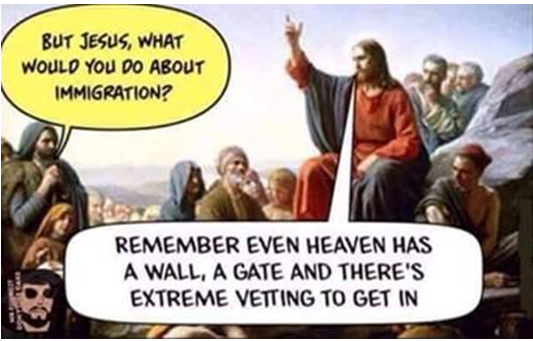 Even in heaven, there’s a big, tall wall (144 cubits tall, which is about 216 feet), a gate that’s specifically designed to fit an extremely narrow entrance so the unrighteous can easily be weeded out, and a permanent, long-term policy of “extreme vetting,” which is to say, you either meet the specific qualifications set by our heavenly Father, or you don’t get in. THE WALL — Rev. 21: 17-18 And he measured the WALL thereof, an hundred and forty and four cubits, according to the measure of a man, that is, of the angel. And the building of the WALL of it was of jasper: and the city was pure gold, like unto clear glass. THE GATE — Mat. 7: 13-14 Enter ye in at the strait gate: for wide is the gate, and broad is the way, that leadeth to destruction, and many there be which go in thereat: Because strait is the gate, and narrow is the way, which leadeth unto life, and few there be that find it. EXTREME VETTING TO ENTER — 1 Cor. 6:9-10 Know ye not that the unrighteous shall not inherit the kingdom of God? Be not deceived: neither fornicators, nor idolaters, nor adulterers, nor effeminate, nor abusers of themselves with mankind, Nor thieves, nor covetous, nor drunkards, nor revilers, nor extortioners, shall inherit the kingdom of God. MORE EXTREME VETTING TO ENTER — Rev 21:8 But the fearful, and unbelieving, and the abominable, and murderers, and whoremongers, and sorcerers, and idolaters, and all liars, shall have their part in the lake which burneth with fire and brimstone: which is the second death. There’s nothing wrong with choosing who can enter your country, and who can’t beloved. It’s Biblical. And it’s Godly. And don’t let anyone tell you otherwise. The Scripture says God’s People (and make no mistake about it, today, Christians are God’s People) are to be “a light unto the Gentiles,” which means we’re to set a good example to them by leading them to Christ. But we’re not a walking mat. We’re to lead them to Christ. Not be trampled on by them.